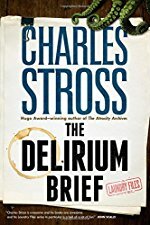 Someone is dead set to air the spy agency’s dirty laundry in The Delirium Brief, the next installment to Mefi's Own Charles Stross’ Hugo Award-winning comedic dark fantasy Laundry Files series! This is a cross-genre low fantasy series that's been published for fifteen years. I figured why not discuss the series in general and the new novel in particular? Anyway, I've finished reading it, and it puts the whole series in a new light; this likely means **HERE BE SPOILERS** for the rest of the series. If you're new to the series, start with either The Atrocity Archives or The Rhesus Chart instead. How perfect is the core concept, a software dude thinks up an algorithm that redirects his career towards super secret supernatural jamesbond lifestyle. Bob is living the life. Probably a good thing I get stuck rotating red black tree nodes the wrong direction, really not a vampire hunter. Thanks, infinitewindow. I knew this was being released soon but I didn't know it was out, and now it's 12:10 AM and my alarm is going off in 5 hours. Okay, that griping aside, was the twist about who everyone ends up working for at the end telegraphed in the earlier books? Without being too spoilery right at the top of the thread, I remember both entities from respective books, but I don't remember there ever being anything suggesting that they were the same entity previously in the mytharc. I've read the previous entries to the series multiple times (it's how I keep my book budget merely profligate instead of ruinous), and I don't see any hint that $entity2 was really $entity1. I just executed a quick re-read, and there are easily-retconnable clues. If Reverend Schiller can contain multitudes after the events of GOD GAME BLACK, $entity1 should have no problem achieving total corporeal possession of $entity2. This may be the least-accessible-to-newbies Internet comment I've ever written. Fannibals got NOTHING on Laundry fans. Thanks for the clarification! I do remember the strong glamour on $entity2 now that you mention it -- I had just filed it under "In this book we're doing $trope so we're going to have a lot of characters doing $trope things," since the rest of the book was going there. I don't distinctly remember the other two bits but it's been a year or two. In hindsight that was a naive assumption, considering there's pretty serious continuity among all the other Laundry books. On the plus side, Stross does seem to be upping the ante/moving the arc along in each subsequent entry. I wasn't sure how many "grimdark deconstruction of fantasy trope" books I could get into in a row, so "let's totally break the world and then see what happens" seems like a pretty good next step. How will Our Protagonists get out of this one? I'm curious if either of you also read the Watch books, and how you'd compare. They're superficially similar in a lot of ways, to include "snarky protagonist levels up from low-level agent to More Or Less A God," but Stross and Lukyanenko seem to have very different concerns. Ah, I'd forgotten about his appearance when looked at via the Bathory mascara -- it may have been Charlie looking at that and saying "well, I can do THIS with $entity2 and isn't now a great time for that?" Especially with the other pieces on the board. I haven't read any of the Watch books, but I'll check the first one out. I didn't know this one was out yet! OFF TO AMAZON. Is CASE NIGHTMARE GREEN in full swing yet? I was expecting some timeliness feelings. I was not expecting those feelings to come less from the setup of "Oh something terrible has eaten the US and is about to eat the UK" and more so from "The stewards of the institutions have Gone Wrong and now the institutions that you have taken as entities in their own right turn out, in fact, to be nothing more but three boys standing on each other's shoulders in a trenchcoat and you are one of the boys so now what/What happens when the layer of abstraction between organizations and the people constituting them collapses?" What do we actually know about $entity1? Not much, but based on what little we DO know, the Laundry's moral ambiguity rating in this book went from high to stratospheric. I think Charlie's doing a great job of raising the stakes and letting nobody out without a lot of blood on their hands. We know that someone was able to stay within the limits of their Laundry oath/gets while secretly collaborating with $entity1 (with the approval of the Auditors, it is implied). That doesn't necessarily mean much, considering compliance seems to be at least partially a subjective thing, and also the auditors are involved. We get the senior auditor's (potentially, if not almost certainly unreliable and/or dishonest) thoughts in this book, too. That's more about "can we make a Faustian bargain" than "what are $entity1's intentions" in both cases, though. To me the interesting question now is "will the Laundry be able to successfully resist the CASE NIGHTMARE portfolio of Bad Things while deriving authority from one of the Bad Things?" (Sorry there's no non-spoiler way to ask that question). What happens when someone fails Sitrep One? Riffing off my last comment: the next time an auditor who isn't onboard with the whole $entity1 business gets access to Mo, we may find out. Are we safely into spoiler territory? Surely we’re safely into spoiler territory by now? Oh, and the Mandate is clearly a Mask of Nyarlathotep . Nothing good can come of this, surely? Quick reply: dropping the $entity1 business -- is Nyarlathotep the Black Pharaoh? (sorry, been a while since I've re-read everything). I thought it was made crystal clear that the Mandate was the Black Pharaoh based on Bob's old manager's response to him -- Bob's old manager is running a Black Pharaoh cult (GOD GAME BLACK IIRC? ); Senior Auditor frees her to get the Mandate out of prison, her reaction is immediately to start calling him "lord." Up until that moment I believed the S.A. was just going to install Mandate as the PM and/or King, thus preserving the authority of the Laundry's Oath/Geas. As soon as she started "Lord-ing" the Mandate, I understood why the S.A. had specifically chosen her to do the rescuing (and he strongly implied that the cult Bob shuts down in GOD GAME BLACK was blessed by Mahogany Row on at least some level). “The Sleeper. You're not saying it's N'yar lath-Hotep itself?" Perhaps the Black Pharaoh incarnate as a mere human is enough to fight off the Sleeper incarnate in its final form. But it's not good for humanity, and it's not good for whatever Mahogany Row has become. Thanks for the history lesson! I should go back and re-read. I'm going to be on a transcontinental this week, nothing to relax in flight like eldrich horror, right? It doesn't look good for humanity in general, yea. I'm thinking the Elves are Chekhov's Gun here -- then again I wasn't thinking the Mandate was Chekhov's gun, before, and here we are, so my predictive skills are clearly a bit rubbish. Whoa, so much continuity. I'm going to have to start rereading these when new ones come out.